The JDLL took place in Lyon, France on the 18th and 19th of November. Mageia was there. The JDLL (« Journées du logiciel libre », i.e. “Free Software Days”) are an annual event organised in Lyon by ALDIL (a Lyon-based association promoting the development of free computing): talks, workshops and business and association booths. 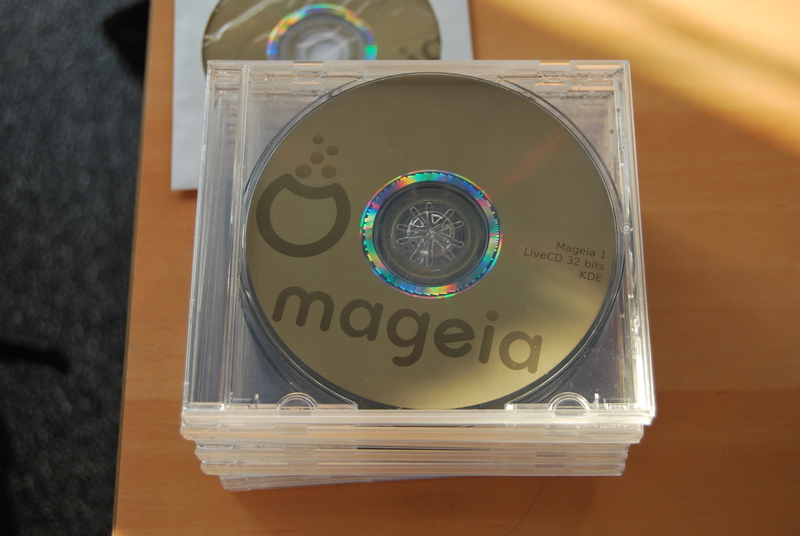 We wanted to give out free installation CDs (and some DVDs) to the visitors interested in Mageia, to encourage its spreading. We made some with our own stuff, since there are no official materials for Mageia yet. Visitors were quite diverse, ranging from neophytes with no knowledge of Linux to advanced users asking for support on a specific subject. 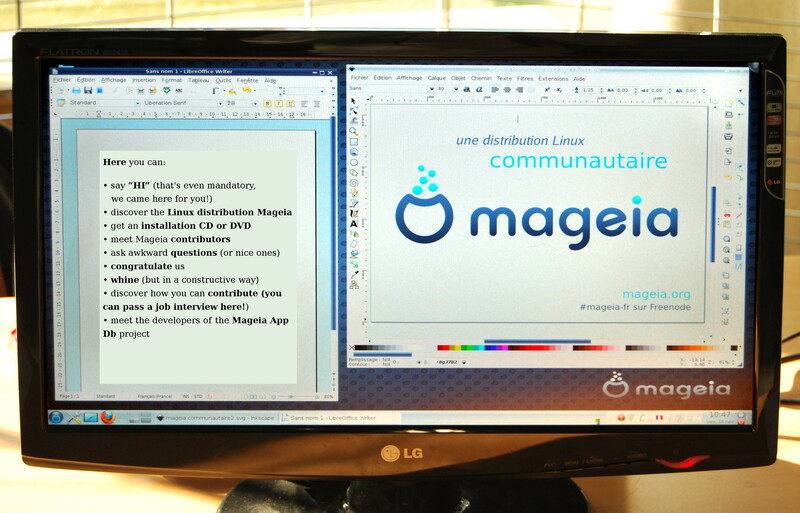 A local mailing list project was conceived during these two days, dedicated to Mageia users from Lyon and its surroundings. The list aims to ease the process of organising install parties and RPM workshops, and also to enable us to support each other. Some users who were interested in it have already given us their emails so that we can notify them if the project becomes a reality. 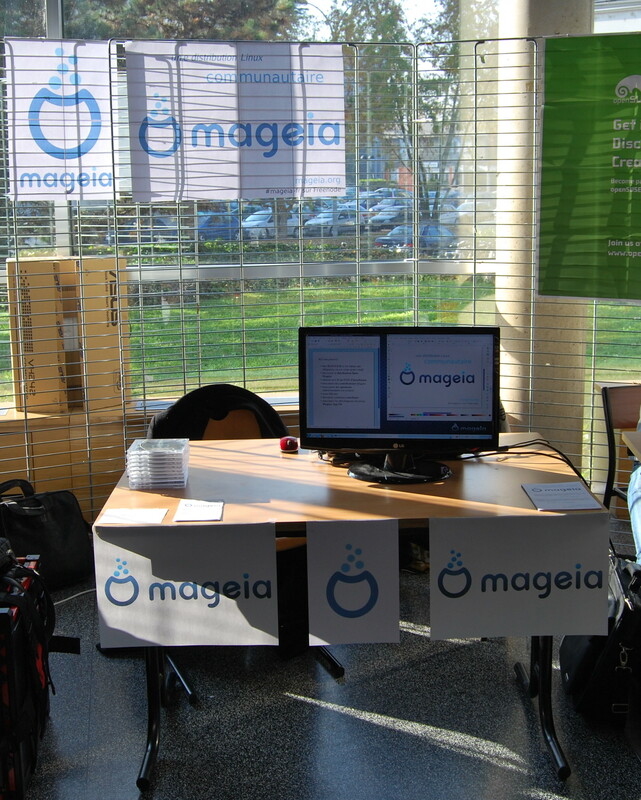 Finally, these two days enabled us to spread the word about Mageia and to show it as a major distribution (one of the 4 distributions which were represented, along with Fedora, OpenSUSE and Ubuntu), to meet more people from the free software community of Lyon and its surroundings, and to have a good time. LibrePC is Daniel’s shop in Lyon specialising in Linux and free software. This entry was posted in events, Mageia, team and tagged event, jdll, Lyon, meeting. Bookmark the permalink. Wow Adrien! Those discs look great! So professional! The second set of DVDroms would have looked better if it covered most of the face of the DVD. Looking for something new. Will try within the next half-hour.